One Piece is very, very popular. Guinness World Record popular, in fact, as in its twenty plus years of being serialised, it broke the record for most copies published for the same comic book by the same author, as well as selling over 430 million copies worldwide, making it the undisputed best-selling manga series in the world – a pretty incredible accolade. Bandai Namco and developer Ganbarion come together for what is arguably the most ambitious One Piece project yet in the open-world action adventure, World Seeker. Series author Eiichiro Oda comes on board for the latest game in the series, penning a new and original tale of the Straw Hat Pirates as they embark on a journey to Prison Island and the treasure it’s said to hold. However, it all turns out to be a trap set up by Warden Isaac (the main antagonist), leading to our crew splitting up and Luffy setting out to find them, uncover the secrets of the island and save the day in the process. It’s a thrilling set up, for sure, but the gameplay just never entirely lives up to the same explosive opening. After falling from the Sky Prison in a daring escape, you take control of Straw Hat captain, Monkey D. Luffy, rescued by new character Jeanne, who is deeply tied into the island’s conflict and decides to help her resolve the issues between its two warring factions of Pro-Navy and Anti-Navy. By all accounts, the story here is not much more than filler, set at an undisclosed amount of time after the Dressrosa/Whole Cake Island arcs, which isn’t to say it’s terrible by any stretch. The main story is actually very good, and the setting on Prison Island is interwoven into the narrative well, it’s just the meat of the story is disproportionately spaced between masses of mostly pointless and repetitive side quests. In exploring the island, you’ll speak to various NPCs who will often have some task for you, which, in my experience, is usually either to retrieve specific items in exchange for a crafting material or some such similar things, beating up a pirate or navy fodder, or both. After an hour or so, you’ll get the gist of how 90% of missions will play out and that’s even including the main story missions. The most frustrating aspect of these regular quests, though, is how often you will be expecting to go from one corner of the island to the other on the very same mission for nothing more than a brief line of dialogue. During one mission, I visited a character as a follow-up to Luffy needing to find some info on the island’s dark past, just for them to abruptly conclude proceedings with a single line of text that was in no way related to the mission. 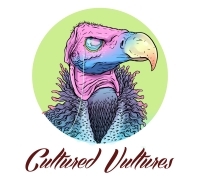 Other times, they drag on and on – tasks that feel like they should have concluded some time ago extend way past their welcome, sapping them of any intrigue and leave you hoping they’ll end swiftly. This is all without touching upon the ‘stealth’ missions, a term which is used very loosely here as there are zero stealth mechanics in the entire game. They are anger-inducing, as all you can do is ambitiously position yourself around the side of an object or wall, move the camera slightly, and wait until the target you are following is far enough ahead that you can pursue. Honestly, the less said about them, the better. All of these missions take up so much of World Seeker’s playtime, so for them to become so dull so quickly is disappointing. Thank goodness for World Seeker’s fast travel option which saved so much time and angst of getting from one waypoint to the next. 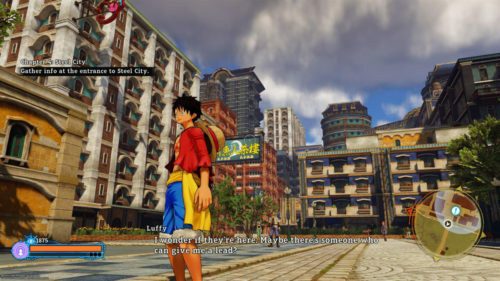 The missions tie into the game’s karma system, in which completing specific tasks and missions from a checklist will increase Luffy’s karma with that character or group. There is no real incentive complete the karma lists, other than unlocking an extra cutscene, making it more of a completionist deviation from the main game and side missions. You can utilise Luffy’s rubber properties to help stretch up to higher points and rocket yourself across the landscape, akin to the grappling gun in the Batman Arkham games, although it’s nowhere near as intuitive. The only rather bizarre negative here is you can’t do this on hilly or rocky surfaces. An oversight in Luffy’s design, perhaps, but one that makes exploration unnecessarily challenging. While running across Prison Island, however, you will get to explore and gather various items randomly strewn across the land. The items, as mentioned earlier, can be for specific side missions but also play into crafting equipment and alternative attire for Luffy, signified by glowing spots on the ground and chests (don’t get me started on how maddeningly long it takes to open these chests). The equipment will improve other stat boosts, such as health bar and attack power increases, making them somewhat valuable to pursue, necessitating item gathering, especially early on in the game. The design of the island does look gorgeous though, with lush textures and vibrant colours that eases the burden of consistent travel somewhat. Except for one or two areas, such as Steel City, it’s just a letdown that so much of the environment is the same hills and village type areas. Much of Prison Island is rocks and hills which, geologically speaking, is fine but does lose its initial allure after a while. It’s also a bit unsettling that, for such a big open world to explore, there are so few NPCs inhabiting the world and those that do are very cookie cutter in their design, bar a difference in clothing or hair. The other beings in the world are enemy navy and pirate figures who will attack you on sight. This in itself is not a problem; Luffy is a wanted pirate after all. The problem is the attacks themselves, especially gun-wielding enemies who just so happen to have infuriating pinpoint accuracy and can shoot you between the eyes from what feels like 1000 years away. Close range shooters can tag you with bullets, where the only way to escape is when they stop shooting you. Tiringly, this will become the norm, as does the combat system in World Seeker. The square button will dish out your standard combo of attacks, but you’ll rarely need to do more than this to overcome even the boss battles in the game. You soon unlock the two variants of Haki: Observation (which is based on quicker strikes and dodging) and Armament (which is for slower yet more powerful attacks and guarding), which you can switch between instantly. Haki opens the combat up to some small degree of variation, but more often than not, all you will need to do is mash the attack button. It massively detracts from putting any thought into which Haki to optimise in battle or any aspect of strategy because there is none to be found. An enemy here and there may need to bust out a ranged attack or two, but it doesn’t matter. It is a nitpick here, but I do wish the Hakis could’ve been blended into one as it feels a bit odd not to have the ability to block immediately accessible. It was upsetting, as I’d hoped the combat would be a fun part of the World Seeker experience, but it winds up so very bland. It takes away a lot of thought from what you may wish to purchase from the skill tree, too. Some of the moves, such as the special moves like the Gum Gum Elephant Gatling Gun, do look great — it’s just not enough to save the combat. The skill tree adds a slight RPG element to the game, where you can unlock various boosts and new moves for Luffy’s arsenal, but the points required to get anything substantial takes a fair bit of grinding to rack up. Early on in the game, I found myself running into battles to try and squeeze little amounts of SP from anything I could punch. This is very much a Luffy-centric adventure, too, which will surely infuriate many die-hard One Piece fans, as the rest of the Straw Hats are relegated to being lifeless NPCs that pop-up in few cutscenes or send you off on one the game’s many, many needless guff-filled side missions. This is, if nothing else, World Seeker’s greatest sin. I truly wanted to like World Seeker, but its shortcomings often reared their ugly heads and refuse to go away. The missions are repetitive, bland and frustrating in equal measure and the combat doesn’t fare much better — for all the exciting moves Luffy has invented over the years, all you need to do in nearly every battle situation is mash the attack button until you win. Plus, almost all in-game dialogue is read from text, draining life from every character and situation. When the actual story does come along, it is genuinely exciting, and new characters Jeanne and Warden Isaac must be praised as worthy additions to the One Piece lore. The skill tree should open up the gameplay for Luffy and make everything more fun and joyous, but you end up with more of the same, and other elements, like crafting and the Karma system, become forgettable extras to anyone but the diehard fans.